EEG diagnostic testing measures the brain electrical activity (brain waves). 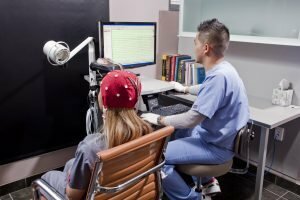 EEG (electroencephalogram) diagnostic testing is intended to provide your doctor with short and long-term monitoring of your brain wave recordings to help evaluate your symptoms. Routine EEG is performed in-office and lasts about 60 minutes. Ambulatory EEG testing records your brain’s electrical activity while you are out of the office performing your day to day tasks. The technologist will place a number of electrodes on your scalp with glue-like adhesive. The technologist might scratch the skin slightly on your scalp to assure electrical conductivity between your scalp and the electrodes. You might be asked to breathe rapidly or look at the flashlight. You will typically sit in a relaxing chair and rest or sleep if possible while the equipment is being connected. You might resume your normal activities immediately, unless you are still drowsy after the sleep deprivation. In that case, you will need to rest in the lobby until you can fully resume your regular routine. These instructions above and additional instructions may be provided by your physician, office staff and technicians prior to and/or at the time of your appointment.